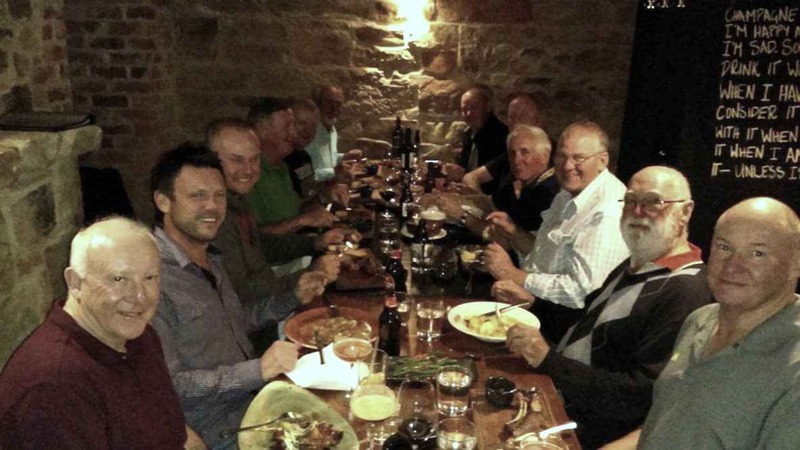 In accordance with tradition established over the past few years, several Roseville members decided to shoot the Easter Prize Meeting at Mudgee and stay with our friends, Ian and Amanda, at the Court House Hotel. To this end, Phill, Dmitri, Mark, Michael Cuda, Mike Hodder, Jon Marriott, Tim and Ian Walter, all made arrangements to stay at the Court House Hotel at Mudgee over the Easter period. Sadly, a few weeks before Easter we received word that Mudgee range had been closed and shortly after that we were advised that Lyndhurst Rifle Club would host an alternative Easter Meeting. Phill arranged accommodation for four people at the Royal Hotel in Carcoar. Mark and Jon changed their plans. So did Ian, so Tim decided to shoot at Lyndhurst. Dmitri offered Tim a lift in his Ford V8 super-charged beast and Mike and Phill travelled in a less powerful auto, nevertheless, Mike and Phill arrived in Carcoar before Dmitri and Tim got to Windsor and they secured our accommodation. Dmitri and Tim were frustrated trying to buy food and alcohol on Good Friday only to be told it was against the law! Nevertheless, Dmitri and Tim arrived in time for the Team Shoot on Friday afternoon and at first we thought that we had finished in 3rd place only to find that a composite team, which included Comrade Kazakov, had pushed us into 4th place! Some afternoon tea refreshments followed and then dinner, Dmitri and Tim sharing Mike’s steak and sausage before returning to the Royal Hotel in Carcoar. An early night followed for all in a clean and friendly hotel. Most of us found Easter eggs on our bed. Breakfast on the balcony revealed some of the wonders of Carcoar High Street, with the adjacent Post Office and B&B for sale for about $750,000. We arrived at the range and did the draw at 500 yards which remained the same for the rest of the meeting. Phill shot a 50.6, Dmitri 48.4, Mike and Tim 49.5 and the Barracuda 60.4. At the first 600 yards, Phill shot 48.5, Dmitri 48.8, Mike 46.5, Tim 49.2 and the Barracuda 58.2. At the second 600 yards, Phill shot 49.7, Dmitri 48.6, Mike 48.6, Tim 47.5 and the Barracuda 59.3. The Day 1 Aggregate saw Phill shoot 147.18, Dmitri 144.18, Mike 143.16, Tim 145.12 and the Barracuda 177.9. It was Tim’s turn to drive Dmitri home in the Beast and this had no influence on our decision to leave the range before the presentation and eat at the pub instead of at Lyndhurst Rifle Club who were putting on a roast spit and a band. The pub was under new management and they did all they could to please us, even though they were fully booked. We had a magnificent meal, mainly oysters and steak with some good red wine and we again prepared for an early night, although rumor has it there was some star gazing and pleasant conversation among some members after dinner. Dmitri and Tim arrived at the range the next morning and were immediately castigated by Greg Emms for not attending the Club dinner, but I think he forgave us. At 500 yards Phill shot 50.5, Dmitri 47.4, Mike 49.3, Tim 50.6 and the Barracuda 60.9. Tim won the match in TR B Grade and the Barracuda won the match in FS A Grade. At the first 600 yards, Phill shot 48.3, Dmitri 46.2. Mike 49.5, Tim 49.3 and the Barracuda 59.5. At the second 600 yards, Phill shot 49.7, Dmitri 48.3, Mike 47.3, Tim 48.2 and the Barracuda 59.3. The Day 2 Aggregate had Phill at 147.15, Dmitri 141.9 Mike 145.11, Tim 147.11 and the Barracuda 178.17. The Grand Aggregate had Phill at 294.33, Dmitri 285.27, Mike 288.27, Tim 292.23 and the Barracuda 355.26. Phill came 15th in TR A Grade, Dmitri 21st in TR A Grade, Mike 4th in TR B Grade Tim 3rd in TR B Grade and the Barracuda 4th in FS A Grade. During the meeting, Phill met Tom Hamilton, who is shooting with Shore School and his father Matt, and as Phill is now coaching the Shore Rifle Team this was a good opportunity for Phill to do some mentoring and to introduce Tom to the returning conquering heroes of the Australian under 25 Team which included our former club member David Smith. We had the pleasure of Tom and his Dad’s company at the Royal Hotel both nights. Congratulations to Lyndhurst Rifle Club on taking the initiative to host a meeting at Easter once it became clear that Mudgee could not do so. Overall, a great weekend and we look forward to shooting at Lyndhurst again. The Victorian Rifle Association 2017 Queens Series was conducted at Bendigo Rifle Range from 29 March to 2 April 2017. Mark Buchanan and Associate member Keirin McCamley competed in the A Grade Grand Championship and Tim Walter competed in the B Grade Queens. All three members stayed with Melissa Frost-Thomas at the former Captain Cook Hotel where 8 other shooters were also staying. Day 1 of the Syme shot over 500, 500 and 600 yards saw Mark Buchanan shoot 147.15 to be placed 13th and Keirin McCamley shoot 145.13 to be placed 27th. Day 2 of the Syme shot over 700, 900 and 1000 yards saw Mark Buchanan shoot 134.6 to be placed 27h and Keirin McCamley shoot 128.5 to be placed 38th. Needless to say, conditions were very difficult, particularly on Day 2 over the long ranges. Mark finished in 23rd place and Keirin McCamley at 37th. The mood of the assembled guests at dinner at the Cook when Tim arrived was quite subdued. Geoff Grosskreutz from Brisbane won the Syme with 293.22 the score reflecting the difficult conditions. Conditions were much better for Day 1 of the Queens shot over 500, 500 and 600 yards. Mark shot 148.15 to be placed 15th and Keirin shot 147.13 to be placed 31st in A Grade. Tim shot 142.7 to be placed 17th in B Grade. Conditions were much the same for Day 2 of the Queens shot over 700, 800 and 900 yards. Mark shot 146.14 to be placed 8th and won 900 yards in the process with 50.6. Keirin shot 144.11 to be placed 22nd in A Grade. Tim shot 143.10 to be placed 3rd in B Grade. All the guests at the Captain Cook went to a very nice restaurant in Bendigo for dinner with Melissa and her husband. Day 3 of the Queens shot over 900, and 1,000 yards. Mark shot 48.6 and Keirin shot 46.4 at 900 in A Grade. Tim shot 46.3 in B Grade. Conditions at 1000 yards were noticeably more difficult on the left hand side of the range where Mark was shooting and seemed to get worse as the range progressed. Mark shot a gritty 48.6 after scoring a 3 with his 3rd shot and Keirin shot 48.3. Tim put 3 birds underneath to score 43.4. Mark finished Day 3 with 96.12 to be placed 5th and Keirin finished with 94.7 to be placed 14th in A Grade. Tim shot 89.7 to be placed 12th in B Grade. Mark finished in 5th place in A Grade with 390.41 and Keirin finished in lucky 13th place with 385.31. Tim finished in 7th place in B Grade with 374.24. The winner? 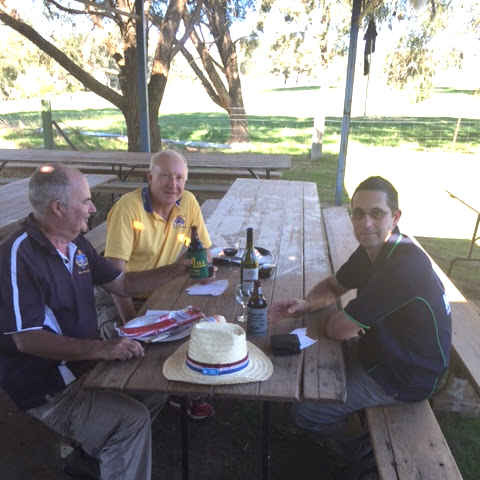 James Corbett of Benalla with 396.47 with our friend Malcolm McKenzie coming second to the legend with 392.43. This was also won by James Corbett with 685.77. Mark came 12th with 671.62 and Keirin came 33rd with 658.49.